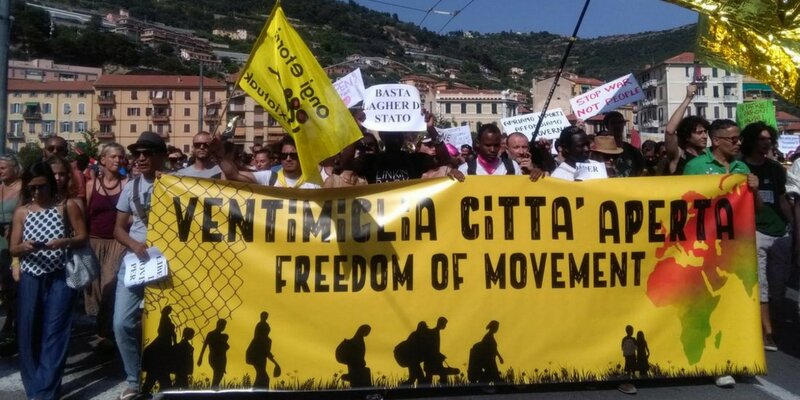 On Saturday a demonstration of 10 thousand people marched through the city of Ventimiglia: an impressive mass of people against the borders and against barbarism, in a place symbolizing the atrocity by migratory policies in recent years. Originally published by Dinamo Press. Edited machin translation by Enough is Enough. These were never before represented by the unsuccessful summit meetings between Italian prime minister Conte and Macron (only apparently opposed). The demonstration started with an action as people set up tents on the riverbed, where the makeshift refugee camp once stood (It was evicted by cops, EIE). A parade without pieces, an anti-racist tide that demanded to open the borders, the freedom of movement and the right to stay for all and a European residence permit for all. There are also numerous pink handkerchiefs that recall the Argentinian green panuelos and which marked the feminist crossing of Non Una di Meno at the event. A call this, not only aesthetic: but a true symbol of self-determination and freedom of movement, solidarity and connection between the struggles. At the end of the demo an action was carried out; the panuelos were tied together and exposed in the square. Another action during the demo saw participants drawing the silhouettes of migrants on the ground who try to cross the borders every day, which have become not only a symbol of exclusion, but also of death nowadays. It is no coincidence that the silhouettes were designed in front of the transport company that deport migrants from the border to the hot spots in Southern Italy. Saturday’s demonstration in Ventimiglia broke the monopoly and showed the hypocrisy of the mainstream public discourse on the issues of reception and borders. The war of this government to migrants is symptomatic of the desire to affirm new authoritarian measures to control lives, dissent and the freedom of all. The contribution of social, migrant and feminist networks in defining an open and inclusive space for conflict on the issues of solidarity and freedom of movement can recreate a space for affirmation and conflict – not just resistance – on issues of solidarity and social justice. More and more today there is a need to connect the subjects and the struggles beyond the borders and to overturn the nationalist and authoritarian drift which is breaking Europe. We are all welcome at home! Previous post: #Zuerich #NoBorders: Down with the fences, fists up!